Lindsay Lohan's Visit from Dad... And the Cops! 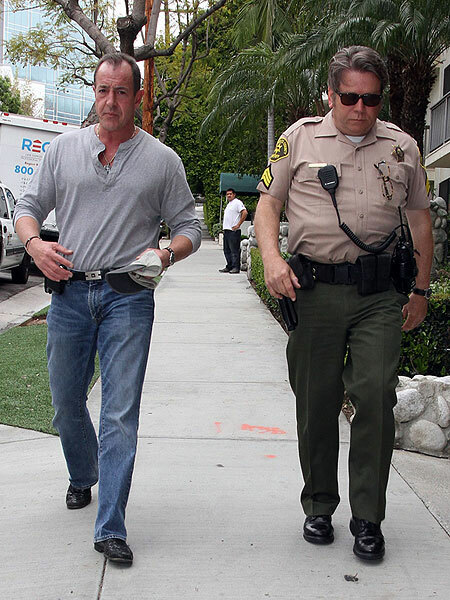 Michael Lohan was an uninvited guest at daughter Lindsay's apartment on Thursday -- with L.A. County Sheriff's deputies -- to check on his 16-year-old daughter, Ali. TMZ is reporting that Michael convinced deputies to do a "welfare check" on his younger daughter, who is currently staying with Lindsay. Following the visit, law enforcement left and Ali stayed with LiLo. The starlet tweeted about the entire incident saying, "I have no choice but to make this public, due to my sister's safety, as well as my own, 'my ex-dad' just WALKED INTO MY APT like the devil's... advocate with officers." She continued to tweet about what it was like growing up with her dad. "Let's not forget, that my father KIDNAPPED me from a COURT ROOM when I was 4 years old and is CRAZY! He has NEVER paid child support, and is marrying a tabloid writer and can barely spell his own name due to his 'brain' that has been ruined due to HIS drug use." An obviously emotional Lindsay's latest tweet said, "When will it ever end... It's been going on my whole life with him -hasn't he caused enough pain? Thank g-d for my mommy... w/out her, I wouldn't even know myself..."